In a match of the 9th round of the Ukrainian U19 championship, Shakhtar faced Karpaty. Ukrainian U19 league. 9th round. September 27. Rava-Ruska. Lokomotiv stadium. 14C. Karpaty failed the opening stages of the league campaign, so in the final four games they got three wins and were sitting in the tenth place with ten points. 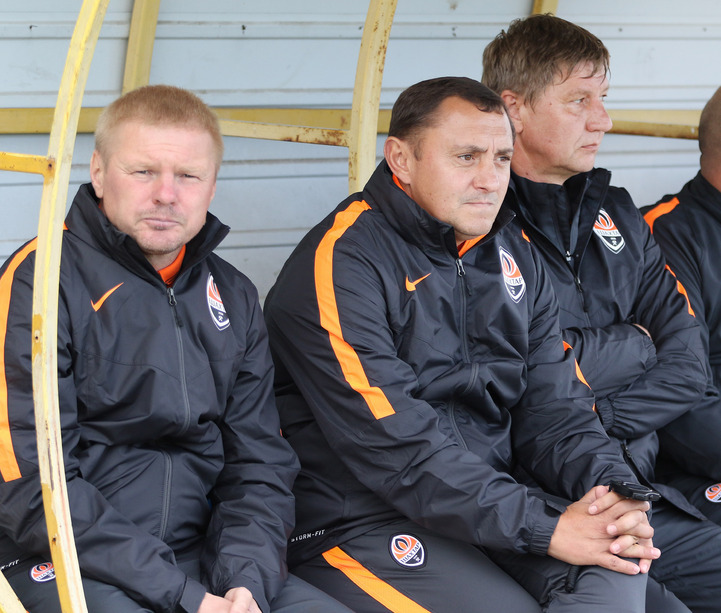 The Pitmen claimed 13 points after hammering Chornomorets and were lying in the seventh place of the Ukrainian U19. The opponents started the game energetically, moving the ball quickly from one penalty box to the other. The Pitmen’s attacks looked sharper. In the opening stages of the game, Sukhaninskyi could have slotted the ball in following a cross from Topalov, but sent the ball wide. The Lviv side, in turn, seized on their chance. Mykytyn opened the scoring when he fired the ball in at the far post. Serhiy Kovalyov’s charges could have levelled: Sukhaninskyi bore down on goal, but sent the ball over the crossbar. Shakhtar’s players created a number of good chances, but were hit on the break in the closing stages of the first half. Karpaty’s defender Andriy Busko darted into the penalty area to double his team’s lead. During the half time break, the Pitmen’s coaching staff made two changes, one which brought fruit. On 57 minutes, Khachaev received a pass before planting the ball into the far corner of the net. The goal encouraged our team and they started to pile on pressure. Karpaty sat deep in defence, without leaving free zones, and committed fouls to stop the Pitmen’s attacks. Topalov had two chances but his slalom runs did not lead to shots goal wards. Then Dmytro created an excellent chance for Porodko, but the latter sent the ball straight into the goalkeeper’s hands. In the final minutes, Serhiy Kovalyov’s team went forward in numbers but the luck was not on the Pitmen’s side today. Karpaty won 2-1. Shakhtar remain in the middle of the table with 13 points. On Wednesday, the Pitmen will play the UEFA Youth League game against their peers from PSG. - It is not the first time when we are talking about it, but today the team again lacked concentration and discipline. After first 15 minutes, we had to be 4-0 or 5-0 up, we created many chances, but unfortunately wasted all of them. By and large, Karpaty’s first attacking move led to us conceding a goal. Then we shipped a goal after counterattack too. We made silly errors of individual character, which led to such a result. I do not think that the boys were at the PSG match in their thoughts. We talked to them about that very seriously. Karpaty showed character, willpower and determination to win – all that we failed to display today. In the dressing room we told the boys that many of them have to think what they play football for. Moreover, for such a team as Shakhtar. Not everyone, obviously, but with such attitude it will be hard for some of them to grow professionally. - It is hard to say something after such a game. We feel very ashamed for this defeat. We wasted our chances, shipped a goal and gave in. We played very poorly today. Again, we feel very ashamed for today’s match. There are only two days remaining before the PSG clash. We will recover physically – we are young, no problems. But mentally, of course, it will not be easy. We have to quickly forget about this loss and gear up for the Youth League.